A native of Burgundy, Hugh was born in Avalon, near Grenoble in 1140 and joined the Carthusian Order at the age of 20. He was highly regarded for his intellectual ability, his integrity and caring nature. At the request of Henry II, he came to England in 1175 to found the first English Charterhouse at Witham in Somerset, which he did in the face of obstacles of all kinds. It flourished so well under his care that in 1181 the King chose him to be Bishop of Lincoln. Hugh was reluctant to leave the monastic life but agreed and moved to Lincoln in 1186. He set about rebuilding the part of the Cathedral which had been damaged in an earthquake the previous year. The diocese was vast and Hugh travelled ceaselessly round it on horseback, ministering to the needs of the people. He stayed at small diocesan manors, as he travelled through the countryside. The most central of these was what has become Buckden Towers. He also had a manor at Biggleswade. Hugh was known for his love of justice and his kindness to the oppressed, children and animals. Throughout his ministry he tended to lepers and in 1190 he risked his life to protect a group of Jews from violence. He also upheld the rights of the peasants against the King’s harsh and unjust forestry laws. Although he was highly principled and outspoken, his conciliatory nature and sense of humour helped him to win over his opponents. Hugh was held in great affection by everyone from peasants to monarchs and on his death in 1200, at the age of 60, he was greatly mourned. At his magnificent funeral the kings of England and Scotland helped to carry the bier. He was buried in Lincoln Cathedral and canonized soon after, in 1220. St Hugh is usually depicted as a bishop, sometimes as a Carthusian. In either case he is accompanied by a swan, as it was reported that a fierce swan at his manor at Stow became very tame and attached to him, although it was still aggressive towards everyone else! 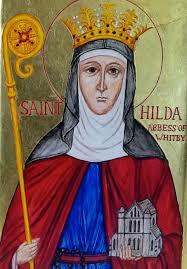 St Hilda of Whitby According to Bede, Hilda lived a secular life until the age of 33, when she became a nun. She first travelled to East Anglia, intending to join her sister in a monastery in France, but returned to Northumbria at the request of Bishop Aidan. Soon afterwards she became the abbess of Hartlepool and in about 657 she founded the monastery at Whitby, then known as Streanaeshalch. Nothing of the original monastery can now be seen, but a Benedictine abbey was founded on the same site in the late 11th century. It is the ruins of that monastery which stand proud on Whitby’s headland today. In Hilda’s time the abbey was a double monastery, home to both monks and nuns. Double monasteries led by abbesses were common in the fifth to seventh centuries. At some, such as at Wimborne in Dorset, there was a strict separation between men and women, but there is no evidence for this at Whitby. Hilda, for instance, seems to have had regular contact with visiting clerics and the religious elite. Bede praises Hilda for implementing a monastic regime that required strict observance of ‘justice piety, chastity’ and ‘particularly of peace and charity’. In her monastery, ‘no one there was rich, and none poor, for they had all things common’. God, who dist signally adorn Thy blessed Confessor Bishop Hugh with eminent virtues and shining miracles, in Thy goodness grant that we may be stirred by his example and enlightened by his virtues. Through Jesus Christ, thy Son our Lord, Who liveth and reigneth with thee, in the unity of the Holy Ghost, ever one God, world without end. R. Amen. We, pray Thee, Lord, that Thy blessed Confessor Bishop Hugh may commend the gifts we are offering, and that with the help of his merits, grace and glory may be ours. Through Jesus Christ, thy Son our Lord, Who liveth and reigneth with thee, in the unity of the Holy Ghost, ever one God, world without end. R. Amen. May Thy blessed Confessor Bishop Hugh render the tribute of our homage acceptable to Thee, Lord, lest our guilt debar us from the effect of this heavenly sacrament. Through Jesus Christ, thy Son our Lord, Who liveth and reigneth with thee, in the unity of the Holy Ghost, ever one God, world without end. R. Amen.